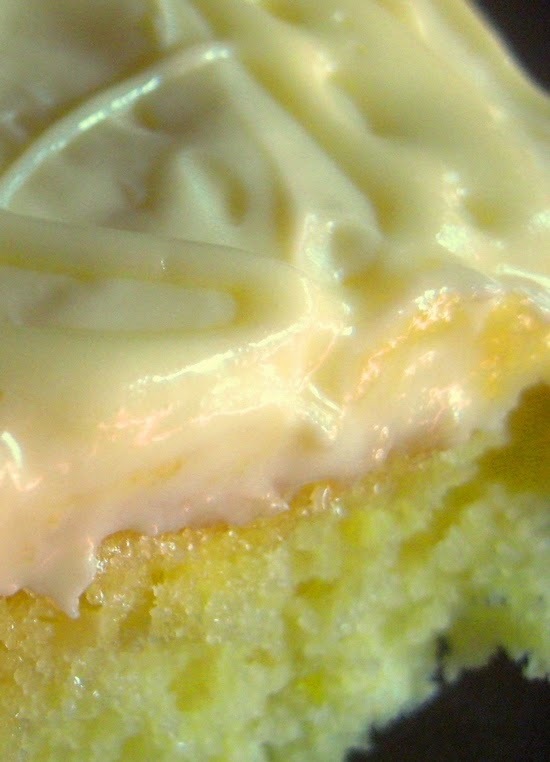 Make the lemon cake mix as directed on package by adding the water, eggs and vegetable oil. Pour batter into a greased 9×13 inch pan. Bake until a toothpick comes out clean when inserted into center. Normally I like to use 2 round cake pans, and that way I have 2 cute little round cakes, but please feel free to use the 9×13 pan instead. (Just check the bake time specified on the cake mix box for whatever size pan you use). Now, while the cake is baking, take your fresh lemon, and squeeze enough juice to make 1/4 cup. Normally 1 large lemon does the trick, but I always buy 2 just in case. If I have half a lemon left over, I just use it for my ice tea or in my water glass. Mix the fresh lemon juice with 1 cup of powdered sugar. Use a fork and mix mix mix it really well. You will have to be sure to mash up the little clumps of powdered sugar. When cake is finished, take it out of the oven and let it sit for 15 minutes. When the time is up, gently poke some holes all over the cake with a fork. Don’t go too crazy, just a couple here and there will do. No need to aerate the entire thing. Spread the lemon glaze goodness around with the back of your spoon. Now place the cake in the refrigerator for 2 hours. Once the glazed cake is nicely chilled, now is the fun part. My little frosting SECRET. Take your tub o’ frosting, take off the lid and the tin foil thingy. Pop the tub into the microwve for 20 seconds. Take out and stir it all up. It should be soft, and just barely pourable. Pour only 3/4 of the tub on the cake and use the back of your spoon to frost the cake. Do that “wrist twist” to make the nice little swirls. Now, take the last of the frosting, there should be 1/4 left, and pop it back in the microwave for about 12 seconds. It should be nice and runny now. Take your spoon and stir it up. Now stand over the cake and keep dipping the spoon in the runny frosting and drizzle swirls all over the top of the cake. It should have a 3-D look to it. Soooo pretty. All this beauty from a regular old tub ‘ frosting!